If you are 25 or older and photographed having a drink at with other adults, you are not promoting underage drinking by that act. Perhaps someone should explain that to Millersville University. MILLERSVILLE, Pa. -- A woman denied a teaching degree on the eve of graduation because of a MySpace photo has sued the university. 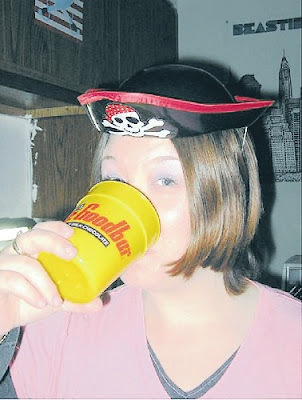 Millersville University instead granted Stacy Snyder a degree in English last year after learning of her Web-published picture, which bore the caption "Drunken Pirate." Allen Lee, 18, faces two disorderly conduct charges over the creative-writing assignment, which he was given on Monday in English class at the northern Illinois school. Students were told to "write whatever comes to your mind. Do not judge or censor what you are writing," according to a copy of the assignment. Officials described the essay as disturbing and inappropriate. So we're not even pretending there's a first amendment any more? We must arrest those whose thoughts and speech makes us uncomfortable. Afterall, it's about the safety of our children and nothing is more important than that, right? BOULDER, Colo. (AP) — A University of Colorado student was arrested after making comments that classmates deemed sympathetic toward the gunman blamed for killing 32 students and himself at Virginia Tech, authorities said. During a class discussion of Monday's massacre at Virginia Tech, the student "made comments about understanding how someone could kill 32 people," university police Cmdr. Brad Wiesley said. Here's an idea. You know that if we don't allow people to express unpopular views and offensive views, those views will go away and we'll have a peaceful society, that is safe for everyone. That kind of repression has always worked throughout history, right? At Oregon's Lewis & Clark College, another student was detained by campus police Wednesday shortly before a vigil for the Virginia Tech victims when he was spotted wearing an ammunition belt. Portland police later determined that it was "a fashion accessory" made of spent ammunition, and said the man did not have a weapon. The belt was confiscated. Tacky? Sure. Inappropriate? Absolutely. Worth a call to the police to investigate? Of course. Reason for the government to confiscate someone's property? Absolutely not. It's one thing when individuals and corporations take private action against someone expressing an unpopular and inappropriate view, like in the Don Imus case. That's the organizations' right. However, when the government is arresting people and taking their property because they think and say unpopular things, then we have a big problem. The Bill of Rights was never about protecing majority and popular views. It's about protecting the rights of the minority. This is the view from my hotel. Flightmemory.com is a site I just found through FlyerTalk. It's a free, personal, online log book for you air travel. You enter information about your flight, such as date, time, cites, flight number, aircraft number, seat, etc., on the site and it keeps track of your travels for you. It will even tell you how many total days and weeks you have spent in the air. And it generates cool maps for you, like the one above. So now I am entering old data. I look up old flights on my past frequent flyer statement. Next, I put the basic data in FlightMemory. To get more detailed information about the flight, I go here. From this site, I can list all the flights form a particular airline at a particular airport on any day going back to 1995. Once I pull up the list, I look for the flight number I got from my frequent flyer statement. That tells me the scheduled time of departure, the acutal time of departure, and the elapsed time in the air. It also tells me the unique N-number for that aircraft -- basically which particualr plane flew that flight. I can take that N-number and enter it here. This will tell me the exact model of aircraft I flew. I just started entering the old data and in a three month period, I flew 2 particular planes twice. I flew Alaska Airlines MD-83 N960AS on both 2005-05-05 (RNO-SEA) and 2005-06-10 (PHX-SEA). I flew Northwest Airlines Boeing 757 N584NW on both 2005-07-12 (SEA-DTW) and 2005-08-02 (SEA-DTW). I'm certain there are many more times I've been on the same aircraft. This is just 3 months of data. Now I just have to get the rest of the data entered going back to 2001. 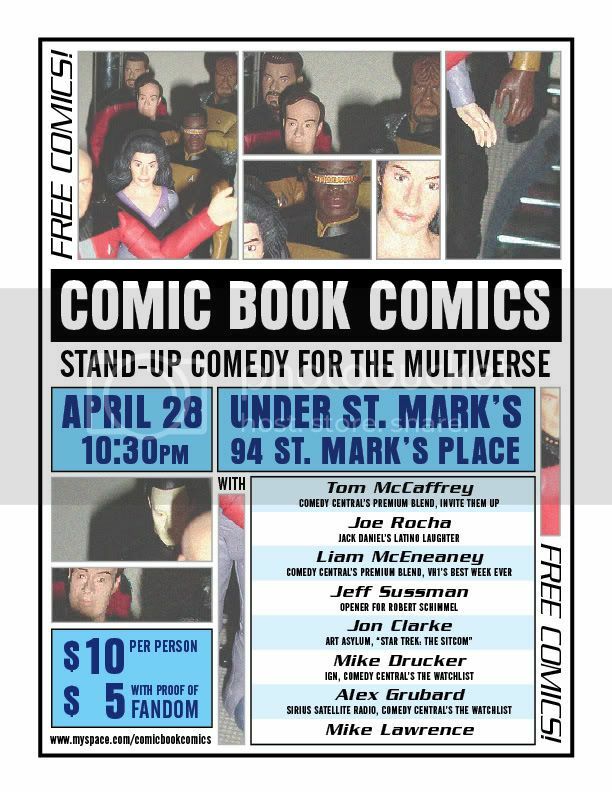 If you are in NYC on Saturday, you like comedy, and you are fan of Superheroes, check out Comic Book Comics. Stand up comics tell jokes about their favorite geeky material that they just cna't do in a regulal club. For more information, check out thier MySpace. I tried to find a Nintendo Wii today. I've been looking half heartedly since Thanksgiving and haven't had any luck. Today we drove to several Best Buys because the listed it in their weekly flyer. They guaranteed a minimum of 12 per store. But we headed out at about 1:00 PM. Apparently, we needed to head out at 1:00 AM. Every store already sold out. At the Lynnwood store, one rep told me they had 15 in stock and sold them all within 10 minutes of the store opening. People lined up early. That's the really amazing thing. The product had been on the market for six months and people are still lining up every weekend, on the off chance a store will have some in stock. Nintendo has a real winner on their hands. Their selling 200,000+ units a month and still aren't close to meeting demand. After six months, the novelty still hasn't worn off. They're still selling for well above MSRP on EBay, too. Fortunately, it falls into the "nice to have" category for me, and not, "I have to have it." I thought briefly about getting up really early next weekend to stand in line for the off chance to get one. Then I came to my senses. I think I'll sleep in instead. After all, it's not like it's a reality TV audition. Bodies...The Exhibition is a touring show highlighting the anatomical structure of the human body. A University in China accepts unclaimed bodies from the government and preserves them through a process called plastination. Using silicon, acetate, and other materials, they preserve the structures of the body in such a way that they can be displayed in full or in part in a museum. Make no mistake -- the bodies in this show are real. People who were born, grew up, lived their lives, and subsequently died in China are now preserved and traveling the country for the general public to see and study. This is the last week of the Seattle exhibit. Next weekend, they put the people and various people parts into boxes and take the show to San Diego. So it was crowded when my GF and I went to the show today. It was a fascinating show. The divided it into multiple rooms showing different organ groups. The first area focused on the bones and muscles. Another room was all about the nervous system and brain. The circulatory system, digestive system, respirtory system and reproductive system also had their own rooms. Most rooms had one or more full bodies opened up so you could see each of the organs they were talking about. These bodies stand right in the room. There is no Plexiglas case around them. You could reach right in and touch the insides of these people. Of course there are signs in front of each body that say "Please do not touch" and, since it's Seattle, nobody touched. Most of the bodies are in action poses -- throwing a Frisbee, pitching a baseball, or swinging a tennis racket, for example. You can see which muscles are contracting and which are relaxing. You can see how they relate to one another. In the first room, they have what looks like 2 bodies supporting one another. It's actually just one body, though. His skeleton has been separated from his muscles. And the full set of muscles is looking at the full skeleton. In addition to the bodies, they have body parts throughout the exhibit, though these are in cases. For example, they have legs and arms with out the skin. They also have limbs sliced in half or opened up in other ways so you can see how things like the wrist or knee work. The circulatory system was fascinating. They used a different process here. Basically they injected a substance into the blood vessels that hardened and preserved them. Then they used other substances to dissolve away the rest of the tissue. This leaves behind just the blood vessels preserved in their original shape -- like red ghosts of the people they used to inhabit. Considering how small and delicate most of the 60,000+ miles of blood vessels are, it's amazing we don't bleed to death each time we walk into a wall. Or wear a hat that's too tight. They also had a section set aside for embryonic/fetal development. They posted a sign outside that room explaining that all the bodies in there were from children who died due to complications during pregnancy or unsuccessful fetal surgery. They also offered a second door through the exhibit so those who were uncomfortable with those bodies or birth defects could skip it and continue though the hall. Here I have some difficulty wrapping my head around the extra sensitivity with which exhibitors have to treat the bodies in this room while being a part of a culture that allows legal abortion. I learned quite a few things at the exhibit. Most organs in the human body are either much smaller or much larger than I expected. The brain is significantly smaller than I imagined. The lungs are much smaller and higher in the chest cavity than I thought. The three bones in the ear are really small. And yet highly sensitive. The uterus is really tiny when not in active use. The liver is much bigger than I thought. And it's the largest internal organ, often coming in at more that 2 pounds. The lungs are designed in a modular fashion. Each section works independently of the others, making it possible to remove just parts of a lung. There is a lot of complicated stuff packed into a very small space in the chest cavity. The navel of an adult is huge, especially when you separate much of the surrounding skin. The creepiest thing I saw was the skin display. Without the structure of bone and muscle, it looked like some sort of Halloween costume, which I guess it is. There were some strange things, too. The eyes in the displays were a little disconcerting. I don't know if they were the actual eyes the people had or if they were artificial. I'm guessing artificial because they were a little too perfect. Several of the bodies still had eyebrows or eyelashes. And some of them still had toenails. The other interesting part of the show was the crowd. There were plenty of adults and children there. The kids generally seemed fascinated, listening to the description on their museum audio tour sticks. A few seemed bored. None of them seemed disturbed by the show. Most of the adults attending also seemed interested, though several of them looked a bit tense as well. Many of the attendees were medical professionals explaining the details of the parts and bodies to their bored friends and relatives. One of the displays was of a Teratoma, which is some sort of tumor. One women called out to here friend, "Oh, cool! Look -- an actual teratoma!" The friend excitedly rushed over and agreed that it indeed was quite cool and exciting. It was a good show. I appreciated the opportunity to see how the body is put together and get a look at these normally hidden parts. I don't know if it's the type of show I can say I really "enjoyed" -- that would seem a bit disrespectful of the people whose insides we were looking at. But I'm glad I went and can definitely recommend it. I should mention that the show is controversial for a few reasons. There are occasional protesters in front of the building. The Seattle PI discussed some of these in its mostly positive review. But critics say this show and others like it don't so much educate as they do desecrate the human body for profit. "Premier is a for-profit company. What they're trying to do is make money for a corporation," said Philip Lipson, a Seattle resident who Tuesday stood outside the soon-to-be-opened exhibit distributing protest fliers. Meanwhile, members of human-rights watchdog groups and some members of Seattle's Chinese community have expressed concern that, not only do the bodies come from a country with a long history of human-rights abuses, but the people whose bodies were used did not give permission for their bodies to be put on display. "I'm troubled by the fact the bodies are from China," said Ron Chew, executive director of the Wing Luke Asian Museum. "There are a lot of issues there." "From a cultural perspective, especially since a number of the cadavers are from China, it feels like a gross violation," said Bettie Luke, who works with various Seattle Chinese American groups. "The willful use of putting a body on indefinite display like that condemns the soul to wander the netherworld with no chance to rest." Markel and others are concerned that shows like this do not use bodies from consenting donors and do not make public the paper trail showing exactly where the cadavers came from. "I'm all in favor of people looking at and understanding the human body," he said, but added that he thinks there are other ways, besides public spectacle, to educate people about their inner workings. "Frankly, I don't want to be somebody's Saturday entertainment." Oddly enough, the most vocal critics of the Seattle show so far are Philip Lipson and his partner Charlette LeFevre, operators of the Seattle Museum of the Mysteries, a Capitol Hill museum that features exhibits on Bigfoot and UFOs and also hosts ghost tours. "We feel that this group is not honoring the dead," Lipson said. "It's not treating them with dignity and is just making a peep show out of dead bodies." "This Seattle exhibit is deeply flawed," Aaron Ginsburg, a pharmacist from Massachusetts, wrote in an e-mail to the P-I. "The bodies were not donated, and may well have belonged to political prisoners. China is not a nation of laws, and any assurances that the bodies were legally obtained is meaningless." Ginsburg has started a nationwide Web site protesting the various body exhibits with a portion of the site dedicated to the Seattle show: http://dignityinboston.googlepages.com/seattle. Tan Truong, a Seattle practitioner of Falun Gong, a spiritual movement banned in China, also is worried about the origin of the cadavers. Though Truong admits there's no proof the bodies are those of imprisoned Falun Gong practitioners or other enemies of the Communist government, he said, "You just don't know what kind of bodies you're getting from China because there's not a lot of regulation. There's a lot of organ harvesting." But Glover insisted, "We are not using the bodies of executed prisoners. We are not using the bodies of anyone that belongs to (the Falun Gong). We are very sympathetic to the cause of the Chinese people that are undergoing the violations of their rights. But because we have a partner in China does not mean we are part of the problem." Dalian Medical University receives the bodies from the government, Glover said. That's because when a person dies in China and there's no one to claim the remains, the government allows the body to be used for medical study. Glover points out that the Chinese government's gifting of unclaimed bodies to universities for study and education is not dissimilar to practices in much of the United States. Unclaimed bodies here often are used for medical study and education, though that does not appear to include use in any of these traveling shows. One of the complaints is that the exhibit can't be educational because it's put on by a company using it to make money. Education and profit are not mutually exclusive however. But that is a rant for another day. During dinner with some friends this evening, I mentioned the recent Play Cole hit, "Star Trek: The Sitcom" (now at over 43,000 views on YouTube). The surprising thing is Trish, sitting next to me, responded, "I think I saw that." Now, my only involvement with this particular project was on the posting and marketing side. I was not involved in the creative side. But still, I was terribly excited that someone I know saw it and enjoyed it without me telling her about it. People are now telling me about this cool video instead of the other way around. It reminded me of when I was in a bar in NYC to see Jon's band played. A woman I didn't know came up to me, and said, "I remember you from your movie." She was referring to the Play Cole classic "You never Heard Such Laughing." I know these are relatively small instances. I am under no illusion that this is any kind of fame. But moments like this remind me why I am part of the Play Cole team. If you do, you'll get a kick out of this site. There's all sorts of things to click on. I miss real tomatoes. Red plump fruits that taste like real food. That real tomato taste can't be found in a supermarket anymore; I've tried. Last summer I went a BBQ in West Seattle. The host succeeded in growing small cherry tomatoes. I could have eaten them all night. This year, I am trying to grow my own. I don't think I could succeed with traditional container gardening methods; I don't have enough space or sun. But I do have a new Aero Garden. This birthday present may be the solution. It has a built in grow light, custom seed mix, individual nutrient tabs, and a bowl. The really cool thing is there is no dirt. I simply put the seed pod in the tray and added nutrients and water to the bowl. The plants grow hydroponically -- in air and water. Then I plugged it in and pressed "Tomatoes." Now I just have to wait 2-3 months. To get to high school I used to take the B22 bus (renamed the Q24 in 1988) and get off at the corner of Van Wyck and Jamaica. There was a small deli on the corner. Days when I wasn’t too late or too broke, I would stop off and get a buttered bagel and cup of hot chocolate. The bagel went in my pocket. I drank the hot chocolate during the rest of the 12 minute walk. Those mornings came rushing back to me when I got an early birthday present. The Sweetheart Cup Company released a ceramic version of the classic NY coffee cup. The cup thousands of us expats grew up drinking from is now available online. It’s the same size and shape. The ceramic “seem” is right where the paper one was 20 years ago. Holding the cup feels right. Feeling it in my hand takes me right back to all those blustery mornings when I was getting ready to change the world. 1) Your email forwarding provider. But I did get several others, and I got some nice comments on myspace. Thanks to all. I'm looking forward to a (hopedully) good 36th year. I just missed getting stuck in a miles long traffic jam today. I was headed north on I-5 on my way home from the airport. As I rounded a bend, traffic slowed down. I saw smoke billowing from up ahead. When I got a little closer I saw everyone moving over to the far right and left hand lanes. A piece of metal was just ahead in my lane. And up ahead was a flaming street sweeper. The driver was pacing up and down the shoulder. The police and fire department hadn't gotter there yet. 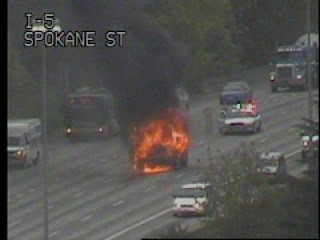 I saw flames licking the bottom of the street sweeper and more flames pouring out the right hand side of the vehicle. I drove by on the left and after I passed it, I saw the state patrol and fire department pulling up in my review mirror. They shut down the freeway to fight the fire and then cleanup the foam. Before they did that, though, the cars, trucks, and busses just drove right passed the flaming hulk of sanitation equipment. I've been a fan since I first watched the show in a Florida hotel room a couple decades ago. 06) At staff parties, I always get stuck talking to a guy named "Shecky"
What the Hell is Wrong with the Burger King People? I really dislike LAX (Los Angeles Airport). It's crowded, outdated, and just a pain to navigate. Everything about it annoys me -- from the lousy shuttle bus configuration to the freaky color changing pillars at the entrance. So I avoid it whenever I can. Fortunately, there are plenty of other options for flying in to SoCal -- SNA (Orange County), ONT (Ontario), LGB (Long Beach), and BUR (Burbank). SAN (San Diego) is even an option depending on where you need to be. Today, I flew into BUR. BUR (AKA Bob Hope Airport) has the worst airport website I've seen in ages. It looks like they hired a high school student to put it together in 1996 and haven't changed it since. I'm sure if I look hard enough, I'll find a BLINK tag somewhere on the page. I flew into BUR and had to rent a car from Budget instead of Hertz. When I rent form Hertz, I step out of the terminal and am in my car in 3 or 4 minutes. With Budget, I had to do extra paperwork. Then I had to catch a shuttle. I missed the first shuttle and had to wait another 20 minutes for it to come back. Then it took them awhile to find the keys to my Ford Taurus rental (I have now driven 86% of all the Ford Taurii registered in the state of CA). Next I headed out to my hotel on the rush hour freeways of CA. My 24 mile drive took about an hour. And where was my hotel? From the time the plane landed to the time I got to my hotel was about 2.5 hours. And for all the hassle -- it still beats flying through LAX. Now that we've been through the political debacles of the third Seatac runway, the monorail, and the viaduct, it's time to dive into the quagmire of the HWY 520 floating bridge. It has exceeded its expected lifespan and needs to be replaced. It crosses a sensitive environmental area and university on one side, and one of the wealthiest neighborhoods in the state on the other. And it carries huge volume of traffic. The Washington State Department of Transportation is trying to get out in front of the dispute and remind people that doing nothing (which is all Seattle ever wants to do) is not an option. So they put out two videos projecting the destruction of the bridge. Robin Williams is a great actor and a brilliant comic. Dead Poet's Sociey is one of my favorite movies of all time. But if you see him being Robin on TV -- he's crazy. Can you imagine what it must be like to work with him on the set? The latest Play Cole film attempts to answer that question. This is a great use for an empty CD spindle. Of course the material probably isn't food safe and might make the sandwich poison, but I still want to do this. Remember When the Constitution Meant Something? No? Did you know that owning a grow light now means the police can come into your home? PULLMAN, Wash. -- A Pullman landlord notified police about a grow lamp in a closet, and police got a search warrant for a drug raid. Eight officers with guns drawn surprised three roommates in the apartment last weekend and discovered they were growing tomatoes. Commander Chris Tennant says it's the department's duty to investigate all credible complaints regarding marijuana growing operations in Pullman. There is so much wrong with what happened here. Unless the landlord was repairing something in the closet, he has no business going in the closet. The landlord reported the tenants have a grow light and a plant, and that was enough for a judge to issue a search warrant? Why even bother with judicial review of search warrants if this is all it takes. They sent 8 cops into the apartment with guns drawn. There are roughly 27 patrol members employed by the Pullman police department. Now, assuming they have 1/3 of the officers on the clock at any given time, that means there were probably 9 officers covering the city the day of this raid. 8 were assigned to this ridiculous raid. Nearly every cop on patrol was sent to this apartment, with their guns drawn, because someone reported a grow light. Unfortunately, the article doesn't say whether or not this was a no-knock warrant. I hope they weren't stupid enough to do that, considering there was no evidence of a crime. Unless owning a grow light is now illegal. Because these tenants grew a tomato plant. And while Tennant may feel it's his duty to investigate credible complaints, there is a beg difference between investigating an accusation that someone owns legal equipment and busting into an apartment with weapons drawn. I hope the Seattle Police Department is more sensible. I'm sure there is already a file on me. Since I grow Basil, Oregano, Chives, Parsley, Sage, Thyme, Rosemary, Mint, and assorted house plants indoors, I have 6-8 grow lights running in my apartment. Of course they are in a big window. And you can see my grow lights and herbs from several blocks away, so there's would be no reason to bust down my door. Hopefully the craziness that infected the Pullman police department isn't infectious. There's something satisfying about watching someone who decides to "upgrade" themselves to first class get caught. I saw someone try this on an Alaska flight once. She boarded early and sat down in a first class seat. Then the passenger who was assigned that seat got on, so she shuffled off to another fist class seat. Then the passenger assigned to the new seat she grabbed got on and she grabbled a third seat. By this time the flight attendant noticed, checker her boarding pass and excorted her to her coach seat in the back. The Seattle City Council took a significant step toward deciding on a "preferred alternative" to replace the Evergreen Point Bridge. They didn't make a decisions. The took a step to deciding. Deciding what they want? No, deciding what they think they probably want. My GF and I went shopping at Ranch 99 last night. Ranch 99 is a the nation's large Asian grocery store chain. The store on HWY 99 near Seattle is as large as any traditional US grocery store. The only difference is that I can't read the labels on half the products. The most confusing item, though, is a bag filled with some fish-shaped corn snack. It's probably what you get when you cross Goldfish Crackers with corn nuts. But can anyone tell me what's happening in the graphics on the front of the bag? An why would would I want to buy a product that seems to makes its consumers remover their underwear in front of the girls in the laundromat? The latest Play Cole podcast is here. Normally, we do an audio commentary of an audio commentary. 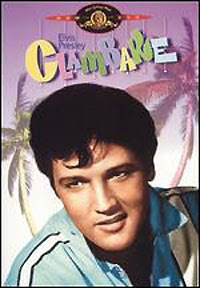 Clambake, a bad Elvis movie, had no commentary, so Mike Drucker valiantly stood in for director Arthur Nadel. This is the movie, by the way, where Elvis first started taking diet pills. NSFW for content and language. Port of Seattle officials held a six and a half hour contentious community meeting in Tukwilla on Friday night. Supporters and opponents of the proposed name change turned out in drives to voice their opinion. Port Commissioners promised to listen to every person and every comment before ending the meeting. The proposal concerns the long awaited name change of the Seatac airport to Seabeltac. The estimates the total cost of the name change to be $79 million. "It's about damn time," said longtime Bellevue resident Ken Adams. "Bellevue is now the hot area of the Puget Sound. We're growing. We're close to Microsoft. We've got the most money. And we are the paragon of style bring some semblance of neatness to the area and bringing Seattle out of that Grunge era. It's about time we were recognized. "After all, it's not Tacoma resident buying those first class tickets and traveling to Europe. Why shouldn't we be part of the airport name." "It's Seatac because it was Seattle and Tacoma who built this airport. Bellevue didn't pay for it. If they want to go back to 1937 and pay for the airport back then, fine. But I don't see them doing that unless Adams has a stylish, expensive time machine he hasn't told us about yet," said Greg Master, 27, of Tacoma. Local Salmon Safe chairwoman, Mist Roslin, explained her organizations objections to the name change. "They'll be changing the signs!" exhorted Ms. Roslin. "That means more ink and the ink in those signs is a known carcinogen. Plus the port will pull down all the old Seatac signs and replace them with Seabeltac Signs, right in the middle of spawning season. We can't allow this to happen. Thousand of salmon will die to protect the Bellevue ego. Leave the name alone. If the Port goes through with this murderous plan, we will be forced to take legal action. " The FAA has yet to weigh in on the name change plans, though they are likely to object to the proposed change in airport code from SEA to SBT. SBT is already the airport code for Tri-Cities Airport, near Santa Barbara, CA. City officials in the City of Seatac were surprised when asked for comment. The Port had neglected to notify them of the plan to change the airport name and the requirement that they change their city name, as well.